The 29th annual Frank Church Conference on Public Affairs will focus on Afghanistan and South Asia. The daylong conference, “Afghanistan After America,” will be held Tuesday, Oct. 16, in the Student Union Simplot Ballroom at Boise State University. 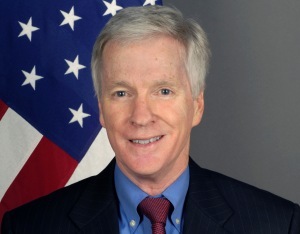 Ryan Crocker, who recently retired as the U.S. Ambassador to Afghanistan, will be the evening keynote speaker. His free address will be at 7 p.m. in the Simplot Ballroom. Ambassador Crocker, a recipient of the Presidential Medal of Freedom, was a career Foreign Service officer whose distinguished diplomatic career spanned four presidents. Previously, he also served as ambassador to Iraq, Pakistan, Syria, Kuwait and Lebanon. He currently is a Kissinger Fellow at Yale University, on leave of absence from Texas A&M University, where he serves as dean of the George Bush School of Government and Public Service. Rajiv Chandrasekaran, who is a senior correspondent and associate editor of The Washington Post, will speak at the conference luncheon. He is the author of “Little America: The War Within the War for Afghanistan” about the complex relationship between America and Afghanistan. Chandrasekaran has reported extensively on the war in Afghanistan for the Post, and served as bureau chief in Baghdad and Cairo. He also has been a public policy scholar at the Woodrow Wilson International Center. Other speakers at the Frank Church Conference include Mohammad Ayatollahi Tabaar, an assistant professor at the George Bush School of Government and Public Service, and Shadman Bashir, an international lawyer at the Center for Law and Religion Studies at Brigham Young University. The conference is free (except for the luncheon and reception) and open to all students and the public. For more information, contact Garry Wenske, executive director of the Frank Church Institute, at garrywenske@boisestate.edu. More information will be posted at frankchurchinstitute.org. In conjunction with the conference, the Frank Church Institute also will sponsor the International Economic Summit for college and advanced high school students during the afternoon of Oct. 16 in the Jordan Ballroom. For more information, contact Leon Maynard, president of the Idaho Council on Economic Education, at leonmaynard@boisestate.edu.